From the construction industry to education, our 50m Open Frame Surveyors Measure is a tool you're sure to appreciate. It has been manufactured with durability in mind, made using high-quality materials and a design that features heavily within specific industries. As with all the other items in our online range, we strive to bring you quality measuring tools at a cost-effective price and this measure is no exception. 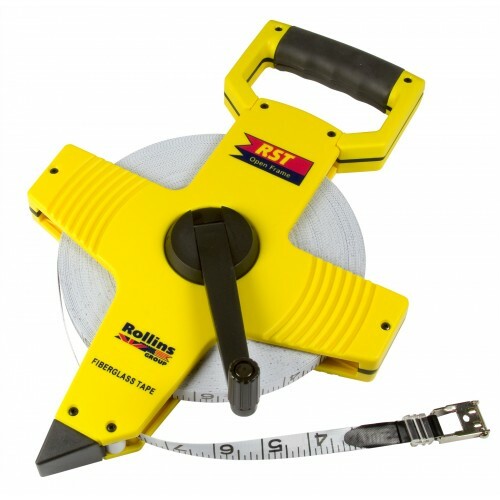 It features a highly visible yellow crossbar frame that houses the 50m tape measure in a compact roll. The large black handle built into the body allows the measure to be rolled back up or extended out, depending on the size of the space in question. Our design also includes a large and ergonomically designed handle that suitably supports the weight of the tool. You can then focus on achieving an accurate measure of any distance - ideal for construction projects that require the utmost accuracy. For added security, the fibreglass body features ridges which offer friction. Extend the measuring tape out fully, jot down the appropriate measurements and roll back up to appreciate the compact and custom-built design of this open frame tool. Along the measure, we have printed large and clear black numbers and line indicators. This allows people of all different skill sets to comfortably use it, knowing that they'll take the right measurements each time. Here at The Ruler Company, we pride ourselves in producing cost-effective measuring tools for all environments. If you have any questions about this 50m open frame measure tape, contact us today.